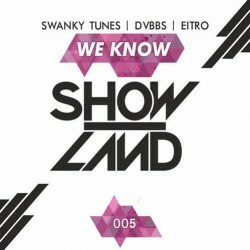 Quite an interesting collaboration out today from the Russian trio Swanky Tunes who we most normally see on the decks with their friends Hard Rock Sofa. This time the big room producers throw down a massive progressive house track, getting help from the recently inescapable DVBBS and another Russian house artist, Eitro. “We Know” tastes bittersweet, possessing vocals that remind me of MGMT and a distinct melody that recalls Tommy Trash’s productions. I’d bet a good deal of money that this track will quickly climb the charts and be a mainstay at upcoming festivals this spring and summer. Swanky Tunes will be heading to the USA at the end of April, playing shows in Las Vegas, Florida, California, and Arizona. DVBBS will be right behind them, with a number of shows across the U.S. and Canada.